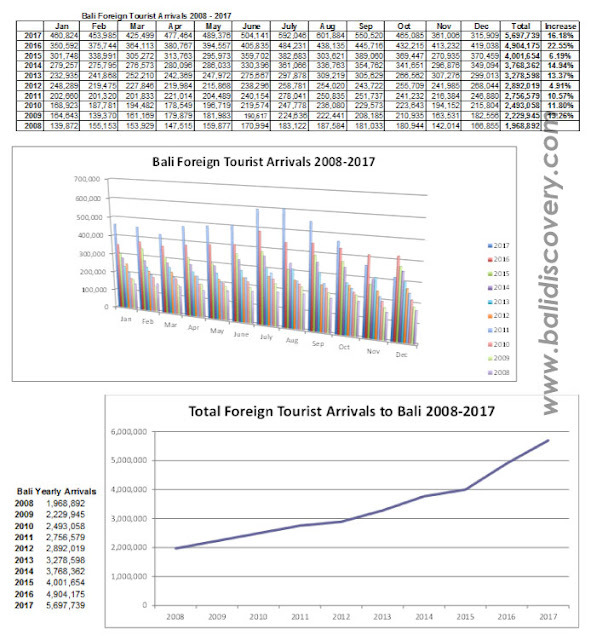 Bali’s target of 5.5 million foreign tourist visits in 2016 was surpassed, with 5,687,739 foreign tourists recorded for the entire year. 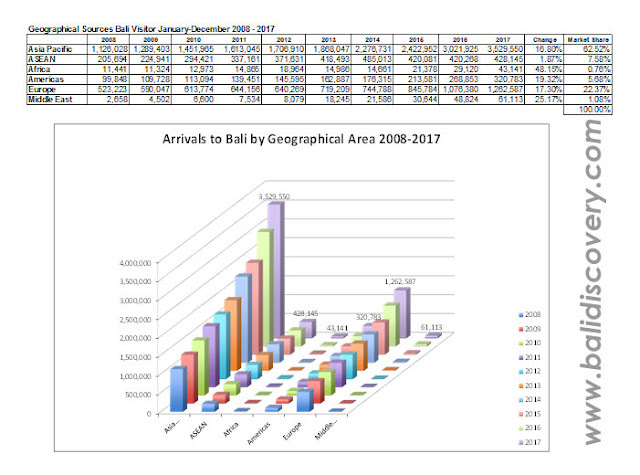 The final tally was a 16.18% increase over the 4.9 million foreign tourists who came to Bali in 2016. 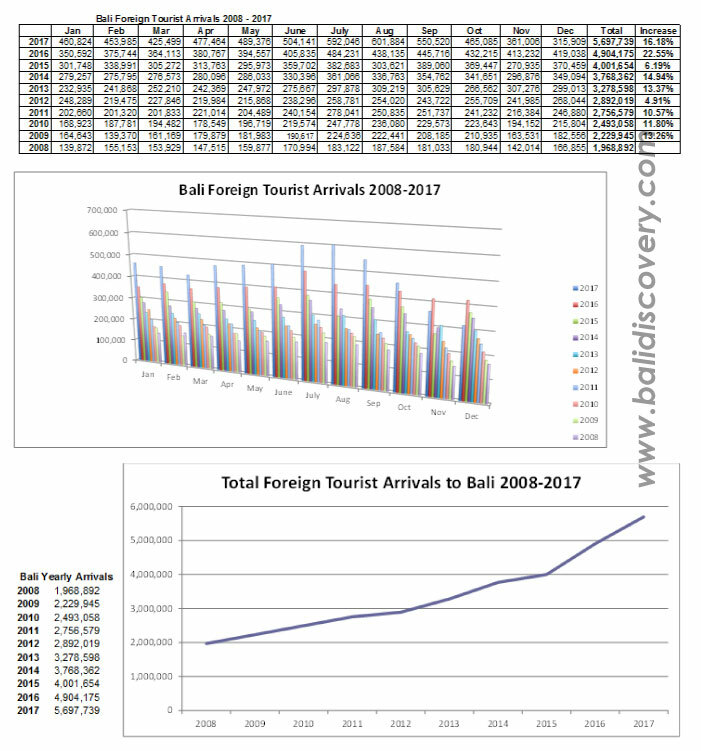 While tourist arrivals in 2017 exceeded the month on month totals for ten months of the year, November and December saw foreign tourist arrivals suffer a downturn due to the volcanic activity of Mount Agung. 2017 was the year that Mainland China (PRC) became the main source of Bali visitors. PRC tourist arrivals to Bali increased by 40.55% to 1,385,850 in 2017. Australia surrendered its dominance as the top source of tourist arrivals decreasing 3.73% to 1,094,974 and repositioning to 2nd place. Also sliding down the ranking of source countries was Japan that lost its hold on 3rd place to India. Indian arrivals were up a dynamic 46.14% ending the year with 272,761 tourists. Japan increased only 7.85% totalling 252,998 on December 31, 2017. 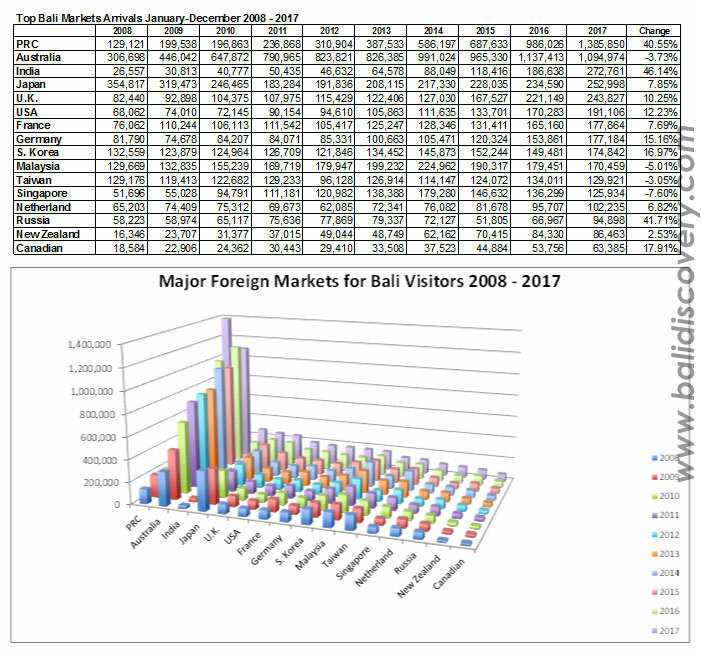 Top performers among Bali arrivals in 2017 were India (+56.14%), Russia (+41.71%) PRC (+40.55%), Canada (+17.91%), South Korean (+16.97%), Germany (+15.16%), USA (+12.23%), and UK (+10.25%).